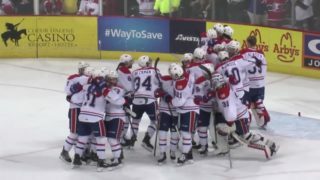 SPOKANE, Wash. — The Spokane Chiefs took advantage of strong performances from their special teams to claim a 1-0 series lead over the Portland Winterhawks in their best-of-seven first round playoff clash, winning 5-2 on Friday night at Spokane Arena. 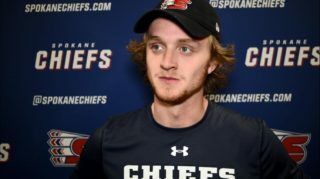 The 1-0 Winterhawks lead stook until 3:08 of the second, when Chiefs’ regular season goal-scoring leader Adam Beckman scored the first of what would prove to be three Chiefs power play goals in the period. 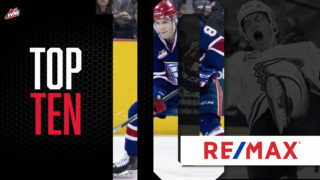 Riley Woods put Spokane ahead 2-1 with a wrap-around score at 12:02, then Los Angeles Kings prospect Jaret Anderson-Dolan picked his first of the post-season — and 12th goal in his last 11 games — at 17:56 to make it 3-1 Chiefs. 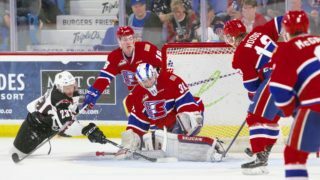 Spokane’s Bailey Brkin saved 34 of 36 Winterhawks shots to earn first star honors while Portland’s Joel Hofer ended the night 17-of-22. 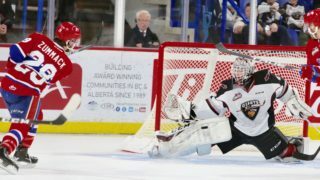 The Chiefs went 3-for-5 on the power play while the Winterhawks were 2-for-8. 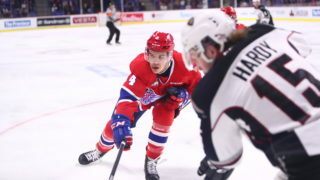 Tickets for Saturday night are available online, via TicketsWest outlets and from the Chiefs’ Ticket Office at Spokane Arena, in-person or over the phone at 509-535-PUCK.